Thank you for your interest in Space Coast Education Center. The staff and faculty share your thirst for knowledge, valiant effort to seek a new path, and desire for professional and personal growth. Our programs of study have been created from our commitment to establish high standards of quality, ethical education and career development. Our primary goal is to prepare you to pass the licensing exams. Our commitment is to assist you in your future endeavors; and, we look forward to a warm and lasting relationship. Space Coast Education Center is licensed by the Commission for Independent Education, Turlington Building, 325 West Gaines Street, Tallahassee, FL 32399-0400, 850 488 9504, License #1364, and approved by the Florida Department of Health, Division of Medical Quality Assurance, Board of Massage Therapy, 2020 Capital Circle SE, BIN #C09, Tallahassee, FL 32399-3259, 850 488 0595. 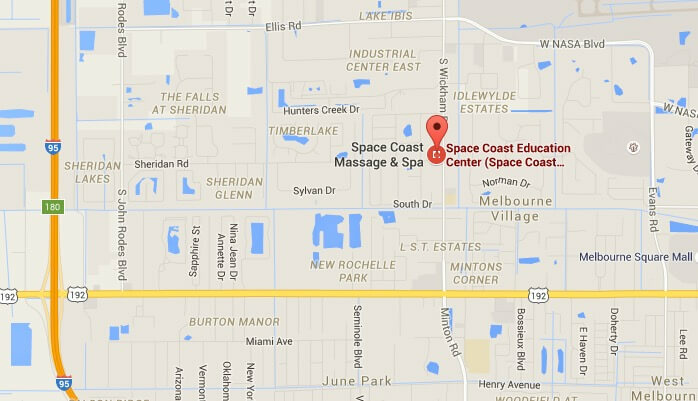 Space Coast Massage Institute, Inc. dba Space Coast Education Center is a private, for-profit corporation. The sole owners and major stockholders are Rick & Jody Stork.